Chelsea and the grandchildren are visiting too! When Nicole Dumontet found out the Clinton family would be staying at the renowned Manoir Hovey in the small Quebec town of North Hatley, booking a room at the same time was the only option. "I have to be frank with you," the Montrealer said in an interview. "We came because the Clintons were here." 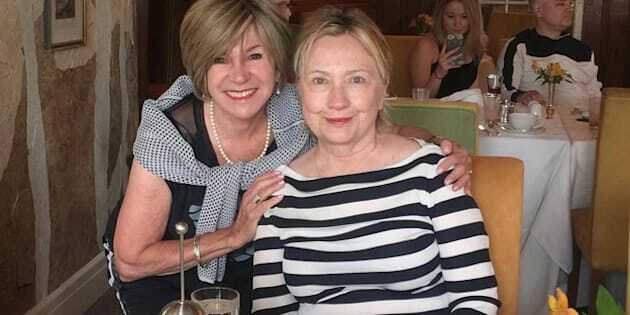 Dumontet, who has actually vacationed at the inn for 20 years, saw the Clintons up close Tuesday, eating breakfast at the table next to former U.S. president Bill Clinton, ex-secretary of state Hillary Clinton, their daughter Chelsea and her grandchildren. She said Hillary Clinton told her she found the area of Quebec very beautiful and that Quebecers are nice people. Dumontet said the defeated presidential candidate did not mind people speaking to her or having her photo taken. But few people approached the Clintons' table on Monday night or Tuesday morning, according to Dumontet. "We didn't want to disturb them too much," she added. Later in the day, the Clintons visited the general store in the town about 150 kilometres east of Montreal and ended up speaking to locals upon leaving the shop. "We're having a wonderful time, thank you," Hillary Clinton told Radio-Canada. "It's so beautiful." The former president said the family went out on Lake Massawippi on Tuesday, calling it "beautiful." "It's very interesting, what's developed, what's not," he said. "For most people it's a very deep lake because it's a glacier lake. These are relatively rare. There are only a few lakes in America as deep as this. It's quite beautiful." He said the plan over the next few days is to "do as little as possible, except play with our grandchildren and have a good time." Clinton, who turns 71 on Saturday, said says he hopes he can see former prime minister Jean Chretien on his birthday. "We're very close friends and I just was with him not long ago." Meanwhile, the North Hatley mayor said the town is buzzing with the visit, which began last weekend and is set to continue through Sunday. "There's a certain atmosphere in the air," said Michael Page. "You can certainly feel the excitement and all the merchants are all hoping to get a visit by the Clintons in their establishment. "They've put up American flags, so on, and welcome signs. And tourists are coming into the town in greater numbers."